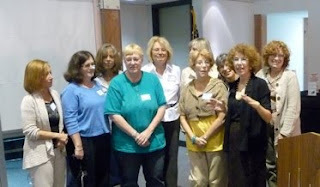 This is a photo from the fall meeting of the Pastel Society of New Jersey, showing the current members of the board. That's me in the aqua shirt there. :-) I'm now the 2nd Vice President of the PSNJ. What fun. We have our annual juried show coming up, with receiving this Saturday. If my painting gets juried in one more time I'll gain "Signature" status with the PSNJ. Keeping fingers crossed. Update: My painting *did* get accepted into the show so I'm now officially a Signature Member. Our Juror was Rae Smith, currently president of the Pastel Society of America, so it was both a pleasure and an honor to meet her, and have lunch with her on Saturday. She did a great job picking the prize winners for our show.